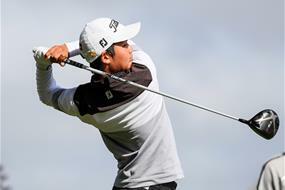 Canterbury’s Kazuma Kobori has stunned the field at the New Zealand Stroke Play Championship with a round of eight-under, 64 on moving day to lead by two shots over Northland’s Luke Brown. After starting the day a whopping five strokes off the pace, the recent NZPGA champion was flawless with eight birdies and just 25 putts to now stare down the barrel of two historic victories in just three weeks. The 17-year-old has been making headlines all week after beating all the professionals, but now he is looking to engrave his name on the biggest stroke play event of the year. “Yeah it feels amazing, entering the tournament I didn’t think I would be able to go that deep, but to have eight birdies and no bogeys was pleasing,” smiled Kobori. Brown is going to have to be at his best tomorrow to make up the two-shot deficit, but with rounds of 71, 70 and 69 he is certainly trending in the right direction and is one round away from history. Playing alongside Kobori today, Brown had a front row view of the magic required and was amazed by his putting to the point where it may have been the best round of putting he has ever seen. Also making a big move today was Canterbury’s Matt McLean who signed for a round of four-under to jump into the final group which will excite the local fans. Auckland’s Carmen Lim has been a model of consistency to also flip the women’s leaderboard on its head and come from four shots behind to now lead by four after a superb round of five-under par. This remarkable eight-shot swing now gives the Auckland number one a chance to claim her first national title and the biggest of her young career at the Christchurch Golf Club tomorrow. The 15-year-old has been threatening for years now and is certainly keen to earn her maiden title. “It was awesome to continue my form today and fight back into a good position,” said Lim. Overnight leader Vivian Lu had a day to forget as she struggled to get anything going to end the day three-over par. However, after witnessing her opening 36 holes, she is more than capable of chasing down her Auckland representative teammate. Brittney Dryland also enjoyed the calmer conditions today by recording a four-under par round to sit in third place, but will have to produce a minor miracle to close the six-shot buffer. Play will get underway at 8:00am tomorrow as we look certain to crown a new champion at the Christchurch Golf Club with both fields providing a shootout between the final group.